Last week, on January 25, Egyptians marked the seventh anniversary of their revolution. This revolution toppled one of the strongest dictators in the Middle East, but because it was a revolution by all the people, it failed to present a leader of its own. It succeeded in cutting off the serpent’s head but is still struggling with the remaining body of corruption and dictatorship. 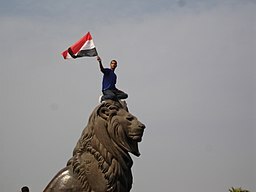 In 2012, the first presidential election after the revolution was marred by the abusing, killing, torturing, and imprisoning of those who spoke up against the Supreme Council of Armed Forces (SCAF) that ruled the transition period. Egyptians were then cornered into choosing between the Muslim Brotherhood and a candidate affiliated with the previous dictator, Hosni Mubarak. In this heavily oppressive climate, especially for secular democracy advocates, the Brotherhood won by a narrow margin. However, because most Egyptians did not want Islamist rule—and because the Brotherhood continued some of the same oppressive dictatorial policies as those of the previous regime along with hardline religious positions—the military toppled the Brotherhood and was again in charge. With their guns and tanks, the military silenced all dissent: no more protests, no more free press or speech, no more real political parties. Indeed, judging by the sheer number of political prisoners who faced trumped-up charges of criminal activity or terrorism, there was no more rule of law. The current government of Abdel Fattah el-Sisi labeled all opposition “terrorism.” The General rules with an iron fist, using his one excuse of fighting terrorism despite the drastic increase of terrorist acts during his rule. In one of his recent speeches, President Sisi said, “Social justice slogans are pretty and shiny but not doable, and so calling for social justice results in the destruction of our country.” According to the General, anyone fighting for social justice wants to destroy the country and is therefore a terrorist. Under these oppressive conditions, as with the 2014 elections, most of the candidates who have challenged Sisi have withdrawn, except this time the withdrawals are clearly forced. Ahmed Shafik, a Mubarak-regime figure and a former military man, announced his candidacy from his self-imposed exile in Dubai. Right after the announcement, Shafik declared that the UAE was holding him captive in the UAE, preventing him from returning to Egypt. The Emirati rulers couldn’t allow such a blow to their reputation, so they shipped him out on the first flight back to Cairo. He was taken from the airport to an undisclosed location where he remained unreachable for a few days, only to appear later in order to withdraw from the elections. The second candidate was another military man, former chief of staff of the Armed Forces Sami Anan. Also a Mubarak man and Sisi’s former boss, Anan appeared to be the military’s alternative to Sisi. His candidacy sparked much speculation: was it a split within the military or simply a ploy to make the elections appear legitimate? But Sisi could not countenance another military man running against him, particularly one who might win. So, the military denounced the once-powerful Anan, citing irregularities and unlawful activities. He is under arrest, and the government plans to prosecute him in a military trial. The third candidate, prominent human rights lawyer and political activist Khaled Ali, was supported by many democracy advocates, especially the socialists. Ali has recently been sentenced to prison in what Amnesty International called a “politically motivated sentence.” Although his campaign attracted much support across the country, a large number of people had already decided to boycott the elections. These people do not trust the process and believe the elections are staged to give Sisi legitimacy. Despite that, Ali was considered a major challenger for Sisi. He eventually withdrew and announced a boycott after the detention of Anan. A few days ago, eight opposition parties also called on Egyptians to boycott the election. The preparations for these farcical elections coincide with the revolution’s anniversary, and this is additionally painful for Egyptians. Still, many patiently watch the events unfold. For no revolution succeeds in its first years. What the revolution did for people’s confidence and political awareness cannot be ignored or forgotten. Twenty years ago, as a young journalist, I remember how apathetic and politically unaware Egyptians were, how they could never relate their daily struggles to the ruling regime and the laws that govern them. A decade ago, just a few years before the revolution, I shared on social media some constitution amendments and labor protests, and it seemed like I was the only one of the hundreds of my friends that was interested. Today, every Egyptian talks about politics. The conversation started, and awareness is rising. One day, democracy, rule of law, justice and rights will win. Oppression, torture, and corruption are not sustainable, even with guns and tanks. The revolution of the minds cannot be stopped.